Hotel Amfora is open all-year round. Our modern family run hotel, complies with the world standards for hotels. Situated in the city of Varna in St. Constantine and Elena. The hotel is 5. 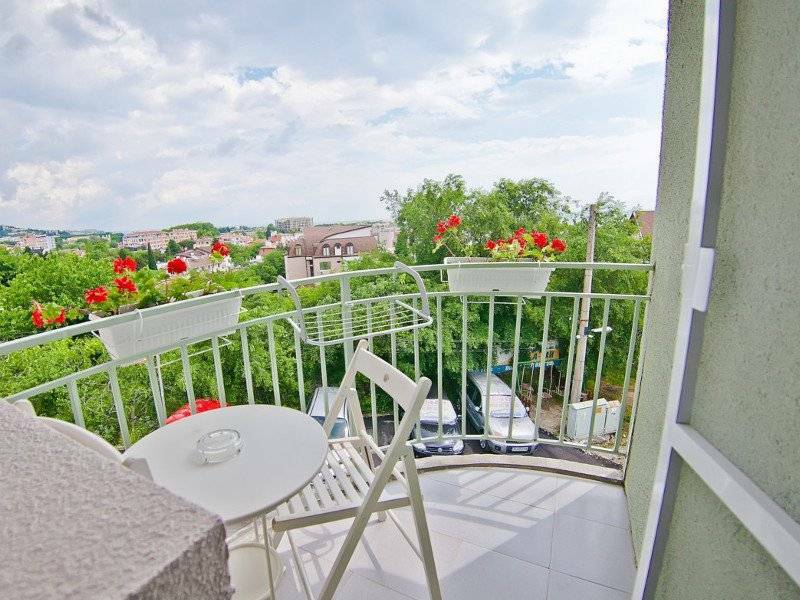 5 kilometers away from Varna city center, 6. 5 km away from the Golden Sands and 15 km from Albena. The distance to Varna International Airport is 13 km. Hotel Amfora is a four-storey modern building with a three-star category. The design is elegant, the stylish forms and the pastel tones shape the exterior and interior of the hotel. Hotel Amfora is fully air-conditioned, has 8 double rooms, 2 apartments and 1 panorama apartment on the last floor – they are all designed with an idea of functionality, furnished with style and attention to details, offering a beautiful seaside view to the Black Sea coast of Bulgaria which is just infront of the hotel. Hotel Amfora has its own parking, which is secured and free of charge. Hotel Amfora offers bikes for rent to our guests as well as we provide free beach umbrellas and cool boxes for beach picnics. The Black Sea is very low salted and it is very good for swimming. The sand on our beaches is very smooth and nice for sunbathing. On the reception desk of hotel Amfora in Varna at St. Constantine and Helena you can get information about all the beaches around Varna, sights and airport transfers. Amfora Hotel in St. St. Konstantin and Elena is situated 5 minutes walk from one of the most beautiful beaches in Bulgaria. We provide the unique opportunity to enjoy incredible peace and tranquility or visit the best restaurants and bars in the resort in no more than ten minutes walk. Hotel Amfora *** has three single rooms that offer privacy and comfort. No matter what your business or leisure trip is, you will get a complete and quality service as we have thought of the smallest detail All single rooms are air-conditioned, the interior design is in soft, pastel colors, contributing to your relaxation. On about 25-30 sq. m there is a comfortable bed, wardrobe, dressing table and mirror, LCD TV with multilingual programs. In-room tea and coffee making facilities and bath towels and cosmetic amenities. The terrace with table and chairs is the perfect place to enjoy the fresh air and the sea breeze. Our double rooms with separate beds are the ideal solution when traveling with a colleague or staying with a friend or relative. With an area of about 30-35 square meters and a capacity of up to two people, each guest will receive comfort and individual space. All double rooms are air-conditioned. The design and furnishings are modern with clean style. At your disposal are two comfortable single beds, wardrobe, dressing table and mirror, LCD TV with multilingual channels, mini-bar, kettle, instant coffee, tea, mineral water and all amenities. In the bathroom you will find towels and cosmetic accessories. All rooms have terraces with table and chairs for morning coffee, evening romance, relax and enjoy the sea breeze. The entire hotel has a pretty interesting architecture that offers a wonderful view of the sea and the vineyards of "Euxinograd Palace". Comfortable standard room with a double bed and an area of about 30-35 sq. m. The capacity is two people, and some can also accommodate a third on a sofa bed. In our double rooms you will get everything you need for your seaside holiday. Individual air conditioning systems allow you to adjust the temperature yourself according to your preference. The design and furnishings are designed in a modern, clean style. At your disposal is a comfortable double bed, wardrobe, dressing table and mirror, LCD TV with multilingual programs, mini-bar, hot water jug, non-coffee, tea, mineral water and all amenities. In the bathroom you will find towels and cosmetic accessories. As with other rooms and suites, standard double rooms have individual balconies with table and chairs. The view is towards the sea or to St. Constantine and Helena Resort. Rooms are suitable for young families, couples in love, families with young children. If you are a family with children or just love the convenience and spaciousness, we recommend you to book an apartment. You will get all the facilities in two separate rooms with a bathroom and a size of about 45-50 sq. m. In one room is a wide double bed with wardrobe, dressing table and mirror, and the other sofa, LCD TV with multilingual channels, mini-bar, kettle, instant coffee, tea, mineral water and all amenities. The rooms are air-conditioned, you can set the temperature according to your individual needs. In the bathroom you will find towels and cosmetic accessories. Capacity is up to 4 people. All apartments have a terrace with table and chairs and sea views. The furnishings and the design are solved in soft, pastel colors that bring the comfort and tranquility of the whole complex "St. St. Konstantin and Elena ". We have come to pay attention to the smallest detail in the interior to leave you the relaxation that you are looking for. Our panorama apartment is located on the top floor and is extremely bright and spacious. With a total area of over 100 square meters, it consists of a comfortable and wide bedroom with a walk-in closet, a relaxing room with a sofa and a 40-inch TV, a dining room with all amenities for our guests. . The kitchen is modern with all appliances - a stove, a fridge, a dishwasher, a coffee machine and more. You will find everything you need, such as cups, plates, cutlery, cooking utensils. The bathroom is comfortable and spacious with towels and all kinds of cosmetics, and there is also a laundry room. The air conditioning system makes it possible to adjust the temperature in individual rooms according to your preference. . The capacity of the apartment is up to 4 people. The interior features a sophisticated and modern Mediterranean style, and it is made with touch to the smallest detail, natural linen curtains and French panoramic windows create a feeling of serenity, timelessness and homey. In the morning you can enjoy the fresh sea air and the unique sea view, you step out with a cup of coffee on the beautiful and wide terrace that offers views as to the lovely and green scenery around and the sea horizon and unique sunrises over him. In the evening, coolness, peace and tranquility, the gentle breeze will make you relax and dream, and if you are fond of the good wine, you can try traditional Bulgarian from our collection. Our panoramic apartment has the luxury and amenities, both for a short break and for long stays. Golden Sands Resort, 5 km. Amfora hotel is in Varna, Bulgaria - specifically the resort town of Constantine and Helena, which lies in a landscaped park on the Black Sea coast nearest to the city. The very centre of Varna is 5. 5km from the front door of the hotel. The town was formerly known as Varna Resort or Druzhba and is directly connected to the Varna public transport system. Local sights include the Euxinograd Palace and Sofia University botanical garden, as well as several marinas, spas and mineral hot springs. The most famous other local beach resorts, Golden Sands and Albena, are 6. 5km and 15km away respectively. Varna International Airport is 13km from the hotel. If you need assistance or advice in planning your airport transfers, please contact us whenever you need to.